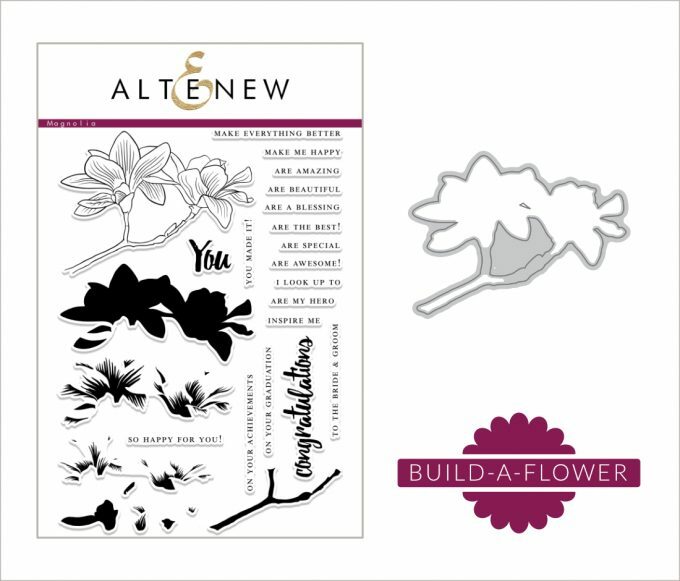 Today is 15th and that means that there is new Altenew Build-A-Flower product released. This month it’s Build-A-Flower: Magnolia. It’ll be only available as a bundle, stamp and die sets won’t be sold separately. Altenew is celebrating this mini release sharing inspiration from design team and also by giving away certificates to Altenew store. Do you like magnolias? I cannot say that I’m a flower person. Which you won’t tell looking at my cards lol. Well, I mentioned this bizarre fact many times. 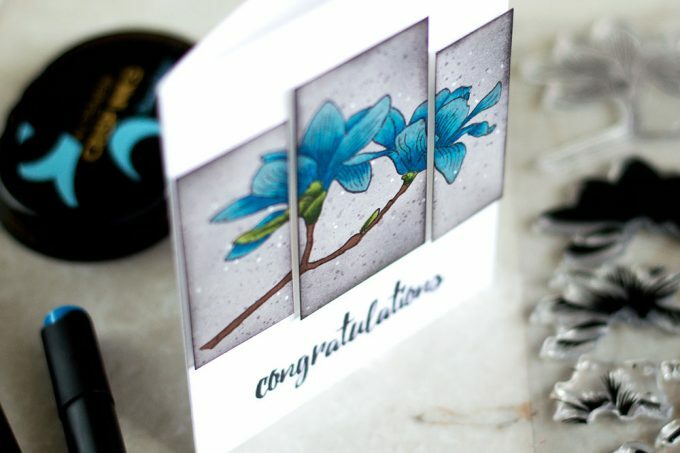 Not being a big lover of real flowers when it comes to cardmaking – flowers are my favorite to work with. Don’t get me wrong. It’s not like I hate flowers in real life. I do enjoy looking at them and smelling them 🙂 But I don’t have butterflies in my stomach when I see them. Like I do seeing a cat or dog … or squirrel … or bird … or any animal really. But magnolias are those rare flowers that make my heart flutter. They look magical to me. And so beautiful. I do like them as well of an art form. So for my card I decided to went with an art gallery kind of design. To start off I inked an Solar White panel using Silver Stone and Industrial Diamond inks. 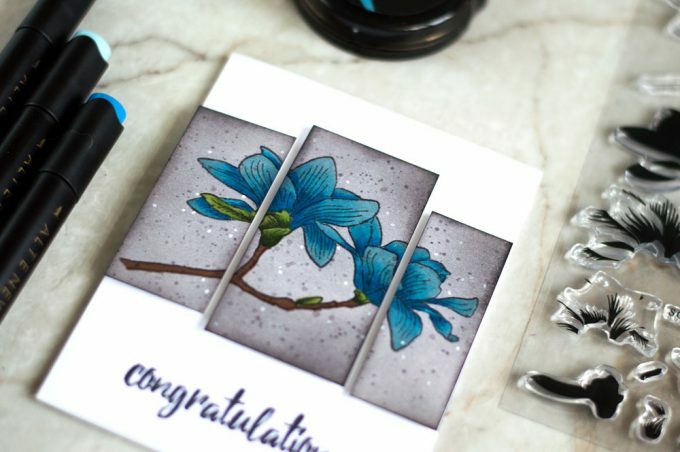 Then I stamp the magnolia branch using Jet Black ink, following by stamping all layers using Ocean Waves, Desert Night, Dusk, Evergreen, Forest Glades and Dark Chocolate inks. After that I colored it using Artist Markers. Which covered my stamping completely, but I referred to stamped layers while was deciding where to put shades. To add a bit of deepness to colors I covered the branch with Clear Wink Of Stella. I then added some droplets of Industrial Diamond and Pure Graphite inks with small brush as well as drew some with white gel pen. I then cut my panel creating three kind of art pieces and foam mounted them onto a white card base. Finally I added a sentiment stamped with Industrial Diamond ink. This time I opted to stay away of any embellishments, like sequins or something. Since I had enough dots on my card 🙂 Besides sequins didn’t go with the whole idea of wall art gallery. I encourage you to check out Altenew blog and leave a comment there as you can win on of three $30 certificates to Altenew store that are given away there. I just love this card design/LO, Svitlana – and your colour choices are so lovely too! I am in awe.. truely magnificent.. I wish I was half as talented! A real stunner Svitlana, your colour choices here are gorgeous! This triptych is pretty enough to be framed and hung on the wall! That card is so stunning. I love the dark background, this card is definitely my favorite out of the bunch. Shh, don’t tell. Wow! Mind blown! This is absolutely stunning! It looks as if the lovely magnolias are on marble or granite! Truly magnificent! TFS! Gorgeous card! Love the panels and the lovely new Build a Flower set! Svitlana, you’ve astonished me, once again!! This gorgeous trio of panels makes for a really unusual, and extraordinary card – LOve the colors, too! Gorgeous tryptich! Love the coloring you applied to this awesome stamp! Thanks for the amazing inspiration! Simply stunning! Love how you did this! I do love this panel effect. Plus what wonderful color! What a beautiful card! 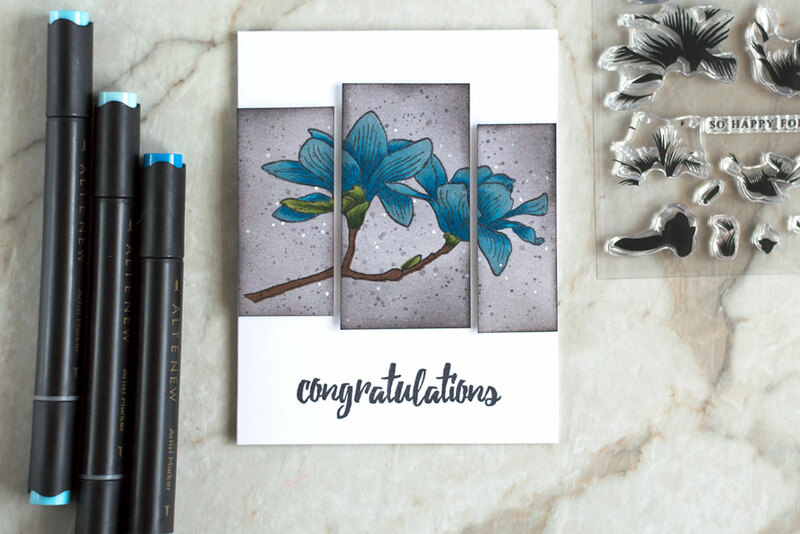 Not only is the magnolia stunning, but the card is even made more special with the three panels you used! Beautiful card! Like the effect with the 3 panels. 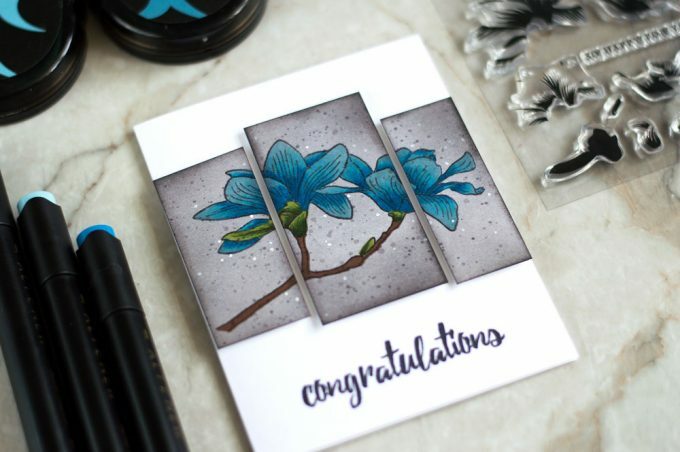 Gorgeous card, love your coloring and the gallery design with the three panels is awesome! A beautiful set elevated to gorgeous by your incredible talent! 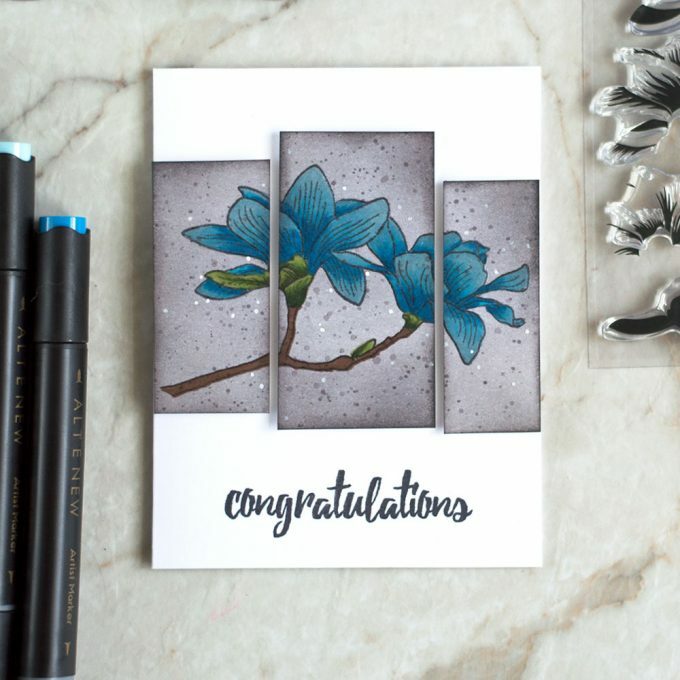 The grey background, the blue flowers, the triptych design …oh my! Talk about a card that makes *my* heart flutter! Thank you for sharing this elegant, delicate and, indeed, dignified flower with us and I agree with the others: this should be framed! This is a really lovely card. I love the triptych design and color scheme. Wow those panels look like pieces of gallery art…love the look. I love this, so stunning. Gorgeous card! I love how you made the 3 panels.